Wrought iron is a metal material that is very durable making it a very popular choice for making outdoor patio furniture. Wrought iron is very heavy as compared to cast aluminum. Wrought iron is susceptible to rust and corrosion, however, if it is looked after properly then it can last for years and years. 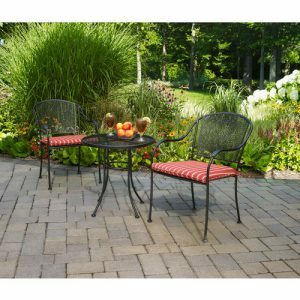 Wrought iron is more expensive compared to other patio furniture options, however there are a lot of advantages to choosing this type of metal for your bistro set. If you are going to choose an outdoor patio bistro set made out of wrought iron, then here are some things that you will need to be aware of about this type of metal. Wrought Iron is Very Durable: Wrought iron is very durable and will not break even during bad weather conditions. All you need to do is make sure that you bistro set has a good paint job on it to prevent it from rusting. Other than that, it requires little maintenance and this makes it a very desirable choice in outdoor patio bistro sets. Wrought is Low Maintenance: Wrought iron does require some maintenance to maintain the beauty of this metal. On a regular basis, clean your wrought iron bistro set with a soft cloth and warm soapy water and then dry it thoroughly. It is important to note, that if the finish gets chipped or scratched by accident it is important to attend to these right away. If the wrought iron metal is exposed to moisture, then over time it will rust. This is the last thing you want to happen. Use a fine steel wool pad and gently sand the area and then apply a rust primer and then paint. Also use a top-coat of wax for lasting protection against the elements. Wax helps to repel water. Wrought Iron is Very Sturdy: Its weight makes it very durable and long lasting. Although it is harder to move from place to place, you won’t have to worry about your wrought iron bistro set ending up in someone else’s yard. It will stay in one place. Wrought Iron Offers Beautiful Designs: Wrought iron can be made into beautiful, visually appealing designs thanks to it being a highly malleable material. As a result, there are many elegant designs to choose from in wrought iron bistro sets.